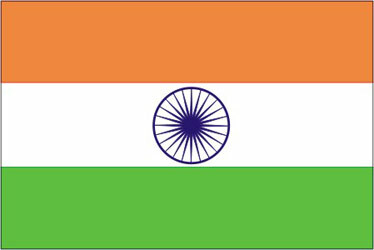 The National Flag is a horizontal tri colour of deep saffron (Kesari) at the top white in the middle and dark green at the bottom in equal proportion. The ratio of the width of the flag to its length is two to three In the centre of white band is a wheel, if navy blue. Its design is that of the wheel (Chakra) which appears on the abacus of the Sarnath Lion Capital of Asoka. Its diameter approximates the width of the white band. It has 24 spokes. The design of the National Flag was adopted by the Constituent Assembly of India on 22nd July, 1947.